Yeah, if you’re a quite fanatic Yu Gi Oh! Trading card game player or maybe you’re only interested in the anime series, I’m sure that you’ve already know about the 3 legendary divine cards. These three cards are almost undefeatable and flawless in every duel. 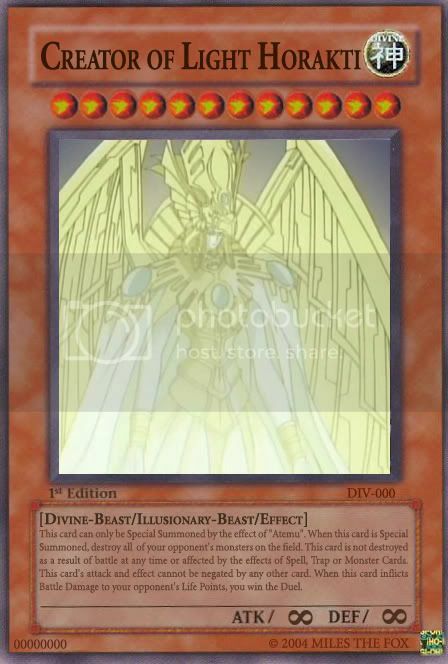 Someone who face this card in the middle of a duel, just able to wish for a luck beside waiting for the divine monster will turn the life points into 0. Here are some little explanations of the three divine cards based on the explanation written on the cards. You must offer 3 monsters as tributes to normal summon or set this card. The ATK and DEF of this card both become the numbers of cards in your hand multiplied by 1000. When this card is special summoned, it is send to the graveyard at the end of the turn. While this card is face up on the field, it can not be targeted by Spells, Traps or Monsters that designate a target. 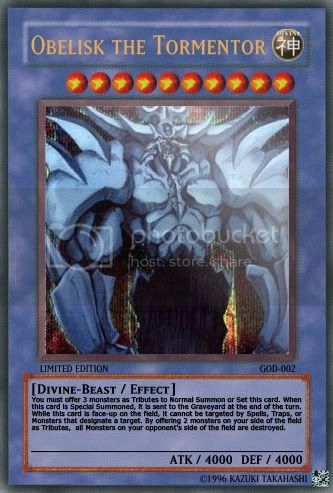 Additionally, when your opponent Normal Summons or Flip Summons a monster with a DEF of 2000 or less, destroy the monster. You must offer 3 monsters as tributes to normal summon or set this card. When this card is special summoned, it is send to the graveyard at the end of the turn. While this card is face up on the field, it can not be targeted by Spells, Traps or Monsters that designate a target. By offering 2 monsters on your side of the field as Tributes, all monsters on your opponent’s side of the field are destroyed. You must offer 3 monsters as tributes to normal summon or set this card. 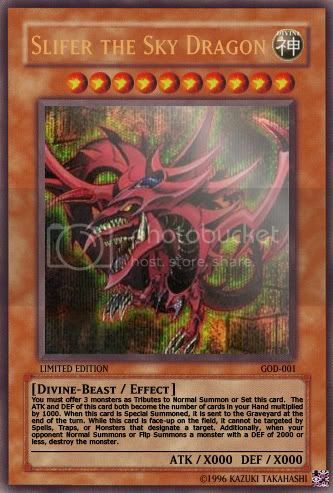 The ATK and DEF of this card become the sum of the respective ATK and DEF values of the tributes. When this card is special summoned, it is send to the graveyard at the end of the turn. While this card is face up on the field, it can not be targeted by Spells, Traps or Monsters that designate a target. When this card is successfully Special Summoned, you may activate 1 of the following effects: 1. Pay 1000 Life Points to destroy 1 monster on the field and remove it from play; 2. 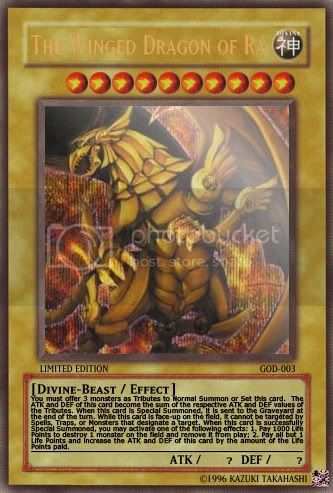 Pay all but 1 Life Points and Increase the ATK and DEF of this card by the amount of the Life Points paid. 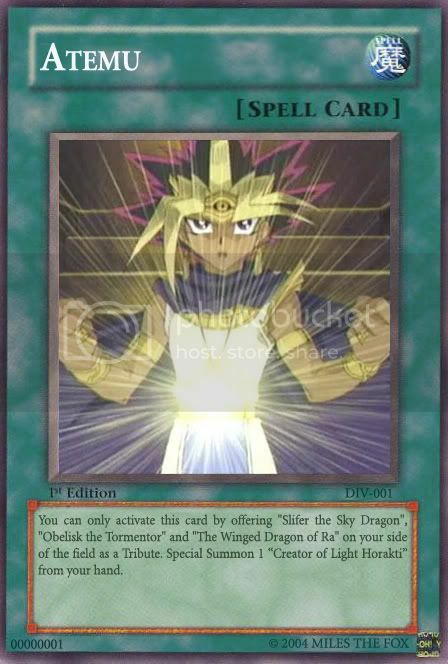 You can only activate this card by offering “Slifer the Sky Dragon”, “Obelisk the Tormentor” and “The Winged Dragon of Ra” on your side of the field as a Tribute. Special Summon 1 “Creator of Light Horakti” from your hand. This card can only be Special Summoned by the effect of “Atemu”. When this card is Special Summoned, destroy all of your opponent’s monsters on the field. This card is not destroyed as a result of battle at any time or affected by the effects of the Spell, Trap, or Monster Cards. This card’s attack can not be negated by any other card. When this card inflicts Battle Damage to your opponent’s Life Points, you win the duel. Yeah, that’s the 3 Divine Cards. The 3 divine cards that usually bring a great difficulty for us when they are appear on the field. But, however, remember there are some flaws of their great power. We can defeat them. If u wanna give your opinion about how to defeat the 3 Divine Cards, you can gimme a comment. Thanks. Wassalamu’alaikum!!!! Use a monster that exceed their ATK or DEF.Use spell,trap or an effect monster that doesn't target one monster only(target every monster),for example:Dark Hole,Lightning Vortex(those cards target every monster on your opponent's side of the field).This works on cards that immune to spell,trap,or effect of a monster that target that card only.